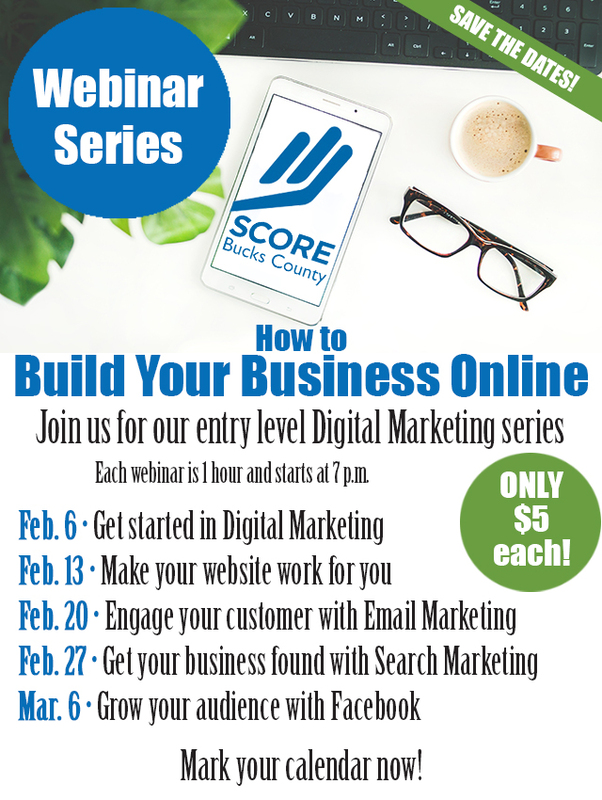 Join us for one - or all five - of our digital marketing webinar sessions. Designed for entry level learners, these hour-long webinars provide attendees with basic knowledge of the various digital marketing tools and platforms. Cost is only $5 per webinar! Reserve your spot now! Webinars will be held each Wednesday beginning Feb. 6 and continuing through March 6. Sessions begin at 7 p.m. Select the Digital Marketing workshops best-suited to your needs! What are you hoping to learn at this Workshop? 30 Second Video: What is SCORE Bucks County and How Can it Help You with Your Business? By submitting this form, you are granting SCORE Bucks County, 11 Welden Drive, Doylestown PA 18901, http://www.buckscounty.score.org permission to email you.